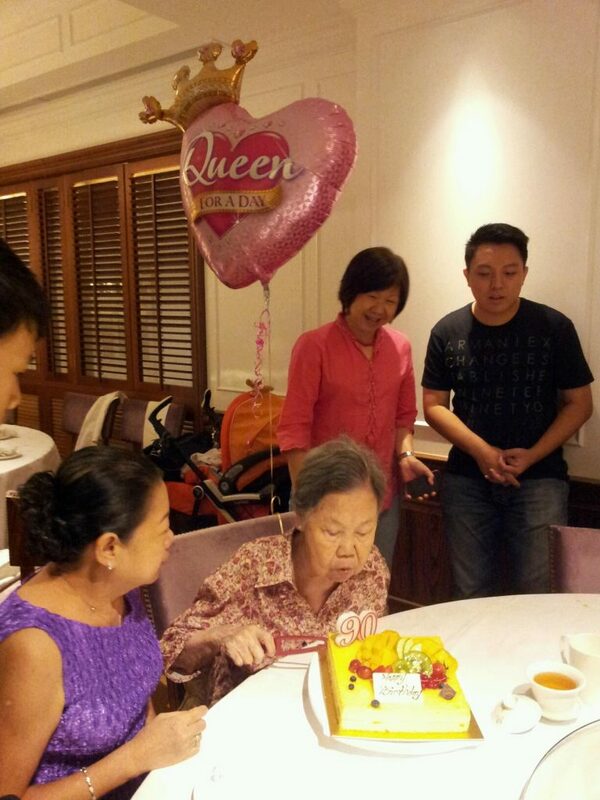 Grandma's 90th birthday, and being Queen for the day! it was my paternal grandma’s 90th birthday celebration on Saturday. My aunt had arranged for a dinner at Bugis, and since we had some errands to run at Suntec & Marina Square, we thought we’d head there with Ollie for the arvo. We had only recently started using the pram (aka Ollie’s alfa romeo) but only with the assistance of our parents’ transport. We have only taken Oliver out using the Manduca baby carrier by ourselves. So..what and how do we take him out? We ended up deciding on the pram with the infant car seat despite not being able to collapse the pram if we attached the infant car seat. Not being able to collapse the pram would mean..not being able to take the bus from our apartment to the train station. And thus a 5-hour outing to run 2 errands. Yikes. Never had there been a time where we’d so actively look out for elevators. A simple journey that could have taken us 30 mins, took us an hour cos we had to walk from our apartment to the train station. Haha. It was mad. The weekend crowd was just as mad. Plus a slightly cranky Oliver 10 minutes into the journey out of the house. I told Donald that I had half a mind to go home to avoid all of this. He was in favour of going home. Bah. But we did have errands to run so we continued the journey. The day out ended with us getting a new “toy” for Oliver, and Oliver finally getting entertained by all the relatives. Poor fella was constrained to his infant car seat and we couldn’t really play with him outside. Think it must have been quite a relief for him to be out and carried by his aunt, grandaunt and grandma. It was relief for me to see him crash out by 8.30pm and not stir at all through the phototaking, and transferring him from the car seat to the bed.